Radio frequency identification (RFID) technology is growing at a rapid pace and is widely used in different applications worldwide. This technology offers many advantages with contactless data and automatic capture in a smart label. RFID technology saves time and significant labor cost. The combination of RFID with battery free RFID sensory based technology has extended the applications of RFID to environmental monitoring and food quality monitoring applications. Increasing demand for battery free RFID sensors in different applications across food quality monitoring, supply chain management, condition monitoring, and structural health monitoring among others has led to the adoption of battery free RFID sensors worldwide. Improvements in overall architecture of RFID technology and form factors have also benefited the RFID industry. 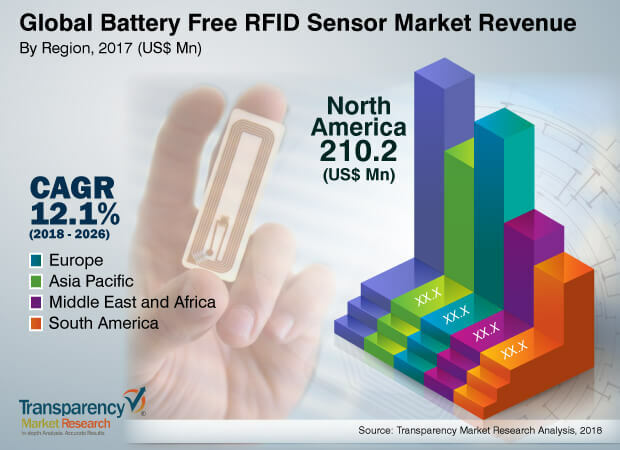 The global battery free RFID sensor market is estimated to quickly grow to US$ 1269.2 Mn by 2026 from US$ 466.3 Mn in 2017, recording a CAGR of 12.1%. The battery free RFID sensor market has seen demand traction due to rising demand for food monitoring as well as in logistics applications. Battery free RFID sensors offer excellent reliability because of low maintenance free solutions and application flexibility. Additionally, companies are continuously aiming on integrating these types of sensors with IoT to identify its real-time location, which is projected to bolster the battery free RFID sensor market. Consumer awareness about safety and efficiency has the potential to boost the demand for battery free RFID sensors. These factors will offer ample opportunities for the growth of the battery free RFID sensor market in the near future. Furthermore, these sensors have become one of the most important items of focus for electronics scientists and researchers. RFID solutions are increasingly being adopted by small and medium enterprises due to the growing trend of digitalization and automation. RFID based security and access control systems are the fastest and more secure as compared to other systems available in the market, which in turn is expected to drive the growth of the battery free RFID sensor market, creating better opportunity for battery free RFID sensor manufacturers in the near future. Radio Frequency Identification (RFID) technology is showing continuous growth in numerous end-use industries such as aerospace, transportation, food & beverages, and healthcare. The increasing population along with rising commercialization is driving investment in RFID systems, which is anticipated to bolster the growth of the battery free RFID sensor market in the coming years. The essential properties of battery free RFID sensors make it the most suitable choice for OEM manufacturers. Increasing application areas of various smart electronics devices is one of the major motivating factors anticipated to drive the demand for battery free RFID sensors. On the flip side, fluctuation in raw material cost and rising price based competition are the major factors expected to hinder the growth of the market during the forecast period. The global battery free RFID sensor market is consolidated with limited number of companies operating in the global market. Leading players are currently focusing on providing technologically enhanced products to customers. Increasing demand for battery free RFID sensor applications with decreasing cost in the long run is expected to encourage investors to invest in this new technology. Maintaining quality standards is essential for battery free wireless sensor manufacturers to adhere to stringent government regulations that are set for different end-use industries in different countries across the world. Moreover, as part of this strategy, companies are engaging in various acquisitions, and focusing on expanding their business and strategic partnerships through new service additions and geographical presence. Some of the major players operating in the global battery free RFID sensor market and profiled in the study include ON Semiconductor, Microsemi Corporation, PHASE IV Engineering, Inc., Powercast Corporation, Inductosense Ltd., Axzon, Texas Instruments Incorporated, Infineon Technologies AG, Farsens S.L, and General Electric. This comprehensive report by Transparency Market Research analyzes and forecasts the battery free RFID sensor market at the global and regional level. The report provides analysis over the period 2016–2026, wherein 2018 to 2026 is the forecast period and the base year is 2017. An in-depth and unbiased market assessment has been made to offer readers in-depth and accurate analysis. The report highlights all the major trends and services playing a key role in the growth of the battery free RFID sensor market during 2018- 2026. It also focuses on market drivers, restraining factors, and opportunities of the battery free RFID sensor market during the said period. The study provides a complete perspective about the battery free RFID sensor market growth throughout the research study in terms of value and volume (in US$ Mn and Units) across various geographies, including North America, Europe, Asia Pacific, Middle East & Africa (MEA), and South America.